I’m always on the lookout for some new “hotspot” for photographing birds. My friends and co-workers know this, and at least once a week, someone calls to say they have spotted a particular species somewhere within my home state of Oklahoma. Sometimes the networking pays off, but more often it does not pan out. Also, I have “regular” spots that consistently prove successful. The best spot by far is less than 50 feet from my back door. That’s right, my own backyard. Over 20% of my stock images come from my backyard, which is a two-acre natural bird sanctuary. Located on the edge of suburbia in central Oklahoma, I have created this avian Mecca through placement of carefully selected shrubs, trees, and cover vegetation. I conducted research to ascertain what sort of botanical plants and trees local birds prefer, both as a source of food, and for nesting. In addition, I have a broad assortment of feeders, nest boxes, and birdbaths. Multiple feeders filled with a variety of seeds, nuts, and grain, increases the number of species able to feed concurrently. Larger birds are less likely to scare away small songbirds if there is room for all. It is important to note: Bird species vary with the seasons, so some planning is necessary to ensure that I am prepared for migratory birds as they pass to and from their summer or winter grounds. 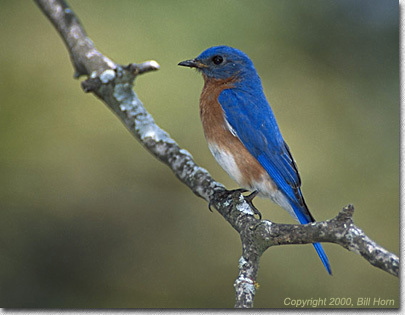 Your state wildlife department can provide information on bird numbers and migration patterns. Granted, my backyard is large, but with research and planning, you can create a similar setup, even if you live in the city. Many avian city residents are accustomed to people, making them more approachable and easier to photograph. The key is knowledge and preparation. 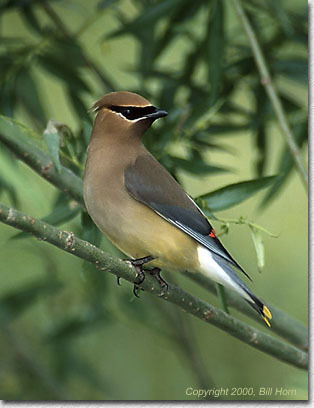 The Cedar Waxwing image was taken in early May, as large migratory flocks passed through my yard. They love perching in my willow trees, where they can hide from predators. If I am lucky, they stay for as long as 2-3 days. I captured this image on an overcast day with a Nikon F5, 600f4 w/1.4x. The light was poor, so my shutter speed was a slow 1/40. I was lucky there was no wind. The Eastern Bluebird male is on his standard lookout perch. The perch is located less than 20 feet from a nest box containing the female and five babies. I intentionally waited until late afternoon to make this image, when the spot was in open shade. The Bluebird’s feathers, when viewed or photographed from certain angles in subdued light, appear almost iridescent, but they lose this quality in direct sunlight. Both images were taken on Fuji Provia F professional slide film. If you want to find the best place to enjoy both watching and photographing birds, you need look no further than your own backyard. All content copyright 2000, Nature Photographers Online Magazine, Inc. All rights reserved.